Expressus Version 4.40 (2017/07/03) New ! PressMotion related functions are updated. 1. 'Rotary Moving Parts' function is updated with added offset angle parameter and expanded subordination parts. To use Expressus Ver4.40 a license which upgrade term is after 10/31/2016 is required. 1. The part type 'Interlock Cam' has been added. 2. Video compression on AVI output has been supported. The deletion by delete key has been supported. The release of simplified Chinese version has suspended. Trouble not to be able to pick an interlockcam element by the 'Coordinate value mesurement' command in a PressMotion port was solved. Trouble not to be able to select an axis menu by the 'Create section' command in a PressMotion port was solved. Trouble not to be able to input using 'Coordinate value input' panel with right button of mouse by the 'Create section' command in a PressMotion port was solved. Trouble shading display becomes wrong when 3D-dimension are display ON was solved at version 4.22c. To use Expressus Ver4.22, a license which upgrade term is after 10/31/2008 is required. A rotary cam can be specified as an option of aerial CAM. A rotary CAM is defined as a CAM driver. The parts which carry out liner moving can be defined. It shows forward action area and backward action area by press angle, and the target parts carry out liner moving within the area. The parts which carry out rotary moving can be defined. It shows forward action area and backward action area by press angle, and the target parts carry out rotary moving within the area. A lower blank holder can specify a lockup type or an following upper die type. When both a lower blank holder and an upper blank holder exist, it will be able to specify which stroke operation is performed previously. The measurement commands can be used in the press motion port. These measurement commands can measure even in the state of the stop during analysis execution. The arbitrary coordinates values in space can be measured. The distance of the arbitrary point and line in space can be measured. The distance between the arbitrary lines in space can be measured. The trouble to which whole dialog box is not displayed in the XGA(1024x768) resolution environment has been improved. To use Expressus Ver3.23, a license which upgrade term is after 03/31/2006 is required. To use Expressus Ver3.01, a license which upgrade term is after 10/01/2005 is required. At the time of reading of IGES, the element which is invisible were read in the state of un-displaying. Moreover, the scene holding the display On/Off state at the time of reading is created automatically. A scene name is INITIAL-1 etc. and the scene holding the state of display On/Off was created automatically. The option which reads only the current layer and current filter element at the time of the writing in CATIA V4 was added in the configuration dialog box. 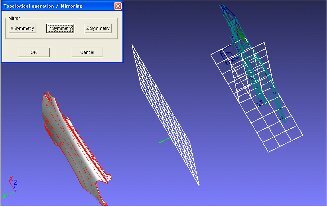 The distance of boundary box dimension and the size of boundary box dimension can be able to specify in the configuration dialog box. Although the background color of 2D port was fixed to black conventionally, it came to be able to perform color specification like the background color of 3D port in the configuration dialog box. The background color of 2D port can be specified now. You can choose language version from Japanese, English and Chinese(simplified) at the time of the setup. Simplified Chinese Version has been released on Expressus Ver3.01. Expressus can be used on the Windows of Chinese version. Simplified Chinese Version has been released. Expressus on-line manual has revised. To use Expressus Ver2.83, a alicense which upgrade term is after 07/31/2005 is required. Expressus secures the upper compatibility of XPS file. Especially when the node which coincide with this parameter has complicated form planes, calculation time is shortened sharply. Usually, the node close to the whole model size is rarely zoomed down until it has the necessity of a LOD display. This parameter is not to create the LOD rough data of the node bigger than the indicated ratio to the whole model size. A new parameter 'Node size to whole size in which LOD is not displayed (%)' is added for the improvement in efficiency of LOD rough data creation. When starting sessions and carry out file management, RTC license feature is required. If the BASIC license is provided, members can log in RTC server, check the presence, and chat among the members. Even when it cannot connect with the RTC server on the internet by rules such as secret maintenance of data, file sharing by RTC or file management can be carried out in the company by setting RTC server in the in-house server. Set RTC server in the in-house server and it can be utilized in the intranet. Check a lisence providing situation from a client PC. By carrying out service registration of a license server, it is started automatically simultaneously with starting of Windows. Create sections by picking the position. Set a relative coordinate system the current coordinate system by indicating the axis around and the angle. Create dimension on 3D port and can select the drawing plane (XY plane, YZ plane, ZX plane, and screen). External distribution of RTC server has started. thickness of the model and display in the color. Seven functions of the following can be used in 2 dimension port. Distance of point and line measurement and Distance of two lines measurement are added. A server module is released. The license to contain the option of the license server is necessary to execute it. Please inform me of computer ID of PC from which the network license is executed and the trial license is issued. It is effective to the following items. This function became available in 3D port. Please refer the RTC pages of 'Expressus Getting Started Manual' about the setting method and operation method of RTC. Please apply for the license password again, if you have a license password published before Expressus Ver 1.32 or before. It changed to the meaning of the stroke to the cam base of the cam slide. The parameter of prior process lifter is added to definition of press project. (Ver 1.62)The three parameters (effective stroke, lift up angle, lift down angle) are used for prior product shape motion. The cam stroke value can be specified by picking two points. Data exchange modules are supported. ・Only one coordinate system can be defined in each node. ・The coordinate system added to the top node is equivalent to a whole coordinate system. ・At the time of taking in assembly structure, the posture of each sub assembly is held as a node coordinate system. ・The commands related to a coordinate system and coordinate axes, such as create demensions and create sections, are handled in the current coordinate system. ・Also, the coordinate axes which show the posture of a current coordinate system are displayed. ・It also has the function which returns to the initial coordinate system which the node holds. ・Parallel translation, rotation movement, etc. can be operated to the element below the specified arbitrary nodes. ・Various topological operation commands which can be operated intuitively, such as movement within a specification plane and match posture, are prepared. ・A sub assembly can be decomposed or it can be used for position adjustment of the gripper finger at the time of using a press motion function. ・There is a function which cancels topological operation and return to an initial topology. ・Scaling command are added in topological operation commands. Curvature radius on any surface can be created easily. The dimension of the curvature radius of a surface can be created by indicating the measuring point on a surface, and the point which shows the measurement direction. When the measuring point on a surface is indicated first, the display of a field which carried out the pick changes to triangle mesh display. Please imagine and point to the measurement direction point from the form by triangle mesh display. The surface area of elements on display and the projection area of the indicated direction of a vector can be obtained. By this command, in order to ask for the area of elements on display, unnecessary elements should turn OFF a display using functions, like "Display OFF Except selected Element." ・Viewing operation became possible only by the drag of a mouse. The whole model can be displayed without changing the posture of the rotation direction. ・The opposite cannot be done although the XPS file made with Expressus of an old version can be opened with Expressus of a new version. The maximum size below arbitrary nodes can be known. The size of a boundary box is interlocked with topology operation, element deletion, etc., and is updated automatically. ・To indicate the coordinate value from the keyboard when a right button was clicked in the state of a point pick, a coordinate value dialog box is displayed became to be possible. The function which can connect Expressus with a file extension is prepared. ・It is the function which changes the element or node near the specified element color into a selection state. The selected node and the selected element can be treated like what was chosen by other methods, such as region selection, and can be used for various uses, such as topological operation, and node change, color change. ・Figure comparison of two models can be performed. The part below a tolerance is searched and a color display is performed. This function is an effective at the time of design change of a product model etc. Isometric port and three view are displayed. The mesurement commands can get the result faster than dimension commands. The results will be output to the text box, so, they can be used with cut and paste operation. as same as section and view. Also, mold clamping force calclation by indicating lateral pressure fudge factor, cavity inside face pressure and safety factor is available as a option. This is effective function on the initial phase of mold design. Both port number 80 and 443 are used on a daily basis in Web browsing, so it makes you possible to use ExpressusRTC whenever you can viewing web sites. ExpressusRTC supports HTTP, SOCKS4 and SOCKS5 proxy. Functions, such as graded colors display, curves on surfaces, a scene, property change, and display mode change, corresponded. When a member does login and logoff, a message is displayed on the taskbar upper part. When an operator pushes the [Audience} button, the operator can choose the next operator. ・The save size of a XPS file has cut down sharply. increased, so that display speed improved sharply. ・All of a license setup, a check, etc. can be performed by this license tool. ・The attestation system has changed into what is depended on Computer ID. in the license tool to apply the license. The license migration to other computers ias possible. ・When you migrate the license, please announce us by specifying the export key obtained by performing license export in the license tool and the computer ID of the cpmputer of after migration on a license migration page. ・The one time license has added at the time of installation. ・The conventional free license was abolished with these change. ・The port where only the direction of visual axis differs from 3D port can be displayed. The existence of the gradation of a background color can be specified now. The option to specify has added in 'Configuration'. ・It corresponds to revolute center movement (F4 key) in the motion port. The stability improvement is planned by improving the memory management. ・Automatic configuration script is supported on proxy setting of Expressus Messenger when 'use browser setting' is checked ..
・The option which doesn't perform interference check between mechanical parts has added. ・Only the license which expiring date of upgrade is after 01/01/2005 can be upgraded. ・OS of Winodws98 or WindowsME is not supported. ・Nine functions of the following can be used in 3 dimension port. ・A thing, such as measuring the distance of the direction of the X-axis between the central point of a circle, comes be made using these auxiliary figure creation functions. ・The created auxiliary figure is held in a node called Aux Figure under Root 3D Dimension. ・The color of a figure is created with reference to the wire color of Configuration setup. ・The color of a figure can be changed after creating a figure. To use Expressus Ver3.10, a license which upgrade term is after 11/30/2005 is required. If grid rounding is effective in coordinate value directions in a locate mode, the rounded coordinates value will be handed over by the command. It's effective in a visual check if the edges correspond and if it has an incline to the axis and so on. It's a function which displays cross lines parallel to the axes in a viewing state. Display a cursor by 2 or 3 cross lines extended to the end of the figure port. 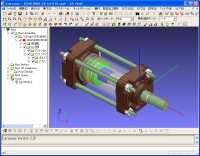 It’s corresponding to CATIA V5 R15 and R16 beta. It’s effective in recognition of the size of a model. It's a function which displays a lattice line in the specified grid pitch. The result of model comparison function can be kept as an element of Expressus. The several results of model comparison can be kept with names. The color of the result of model comparison can be changed. It's useful to transmit the result of model comparison since it's kept also in the XPS file. Symmetrical operation in the topological operation will become effective. The long tool bars have been arranged. To use Expressus Ver3.42, a license which upgrade term is after 06/30/2006 is required. 1. The height dimension corresponded to a current coordinate system. 2. The height dimension to the coordinate axis of a current coordinate system is obtained. 3. The height dimension of an not orthogonal face to a main coordinate system such as the cam slides is obtained. 1. The gap dimension between parallel lines in 2D port in the cross section can be obtained. 1. CATIA V5 Release17(V5R17) is supported. 2. The data exchange modules are replaced with the latest one. The problem concerning reading the XPS file was solved. The problem concerning the deletion of the model comparison result was solved. To use Expressus Ver3.61, a license which upgrade term is after 11/30/2006 is required. 1. Expressus converter [EXPCONV] is a tool which can convert model files to XPS file. 2. EXPCONV option feature is included in Expressus basic license from Ver 4.11. The customer during the up-grade duration of policy is covered. 1. AuthoringXPV is a Expressus license option feature which is able to make XPV files. XPV file can be opened on a Expressus without license. To use Expressus Ver4.11, a license which upgrade term is after 10/31/2007 is required. 1. It happens on loading file like a IGES, creating section and creating view. To use Expressus Ver4.31a a license which upgrade term is after 10/31/2009 is required.